Hi folks! This is a continuation on the blog post I did before about Rick n Morty S1E10's analysis! Enjoy! Rick's using self signed certificates! The allegorical reference I'd like to get into is the broken authentication protocol used by the Council of Rick's Security Officers in the restaurant. The scene happens after Rick has escaped the council's trail in which he was accused of murdering a bunch of Ricks. This is where he ends up after running through a number of universes to through them off his scent. 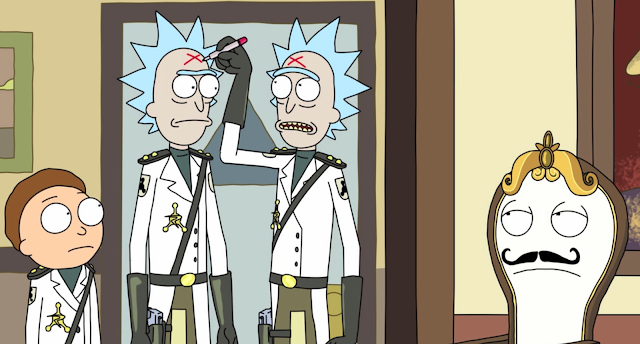 In this scene the Rick's try to claim that they are to be securely identified by a simple "X"; a marking they to that the restaurant concierge doesn't confuse them for Rick C137. What is happening is an authority is claiming they are in charge of a given means of identification "they are the only one's with the right signatures (X's)". In a way this is an expression of something governments do all the time; that is mark people as bad guys for arbitrary reasons; thereby forcing us the population to mark them as such also. When the president says Drugs are the enemy; everyone says Drugs are the enemy. Not many people question the labeling but yet aggressively use it to also find "bad guys". The lesson being: for signatures of this kind to work they must provably be only producible by the authority!